Sunny Days Are Here Again with "Meet a Girl Like You"
A wonderful hidden gem of K-pop has made another comeback! 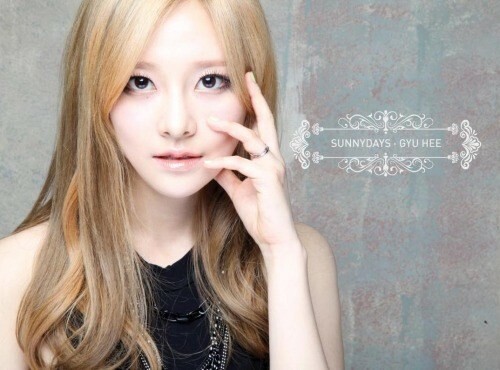 Sunny Days has returned with two new members and a brand new MV. Their fourth single, “Meet a Girl Like You,” is a song that continues the trend of showcasing the girls’ powerful vocals. These girls have always seemed to fly under the radar, but have managed to capture the hearts of fans –as well as my own– with their powerful voices and soulful performances. For those of you that have missed out on the wonder of Sunny Days, they debuted back in 2012 with the single “Take Away,” and have had solid singles ever since. They have a more RnB vibe than that of a pop sensation, though their singles have been getting a bit more up beat in tempo. The group has impressed many with their live performances, though the ladies have yet to break through to main stream popularity. The new members, makane Gyu-hee and vocalist Bi-chen, fit in quite well with the five veteran members. For those worried that the additions were merely pretty faces, the quality of their vocals can put those fears at ease. The group continues their trend of impressing fans new and old with this newest release, leaving no fan disappointed. The song is about the feelings after a not so mutual break up and how the girl left behind hopes her ex meets a girl who loves like him so he can understand the pain he put her through. The MV starts off with a close up of Seo-yeon and wastes no time getting into the music itself. The story of this MV is one of many, a cheating guy (played by Byun Hyo-sung) and the broken-hearted girl(s) he leaves behind. We see that Seo-yeon’s boyfriend is seeing fellow member Gyu-hee on the side. While it’s clear that Seo-yeon knows of her lover’s affair, it’s unclear if Gyu-hee is a knowing participant, though it can be assumed that Gyu-hee is aware of someone other than herself in the relationship. We are then shown a brief glimpse of Seo-yeon pleading with her lover to stay to no avail, as he eventually leaves her after breaking off their relationship. As he drives away, the full devastation of the breakup fully hits Seo-yoen as she steps onto the edge of the building in what is alluded to be a suicide attempt. It briefly seems that Byun Hyo-sung gets away scott-free,but upon reuniting with Gyu-hee, she rebuffs him, leaving him in the same state as Seo-yeon (sans suicide attempt) since he did indeed end up falling for a girl like himself. The previous scene of Seo-Yeon’s attempted suicide is replaced with an image of her smiling at us from what we can assume is her bed (or possibly the after life, since everything is blindingly white and rather “angelic”). It’s juxtaposition to the often cloudy or, at the very least, dimmed scenes with her and her lover, as well as her on the roof. That trend is seen throughout the MV with the brighter scenes of Seo-yeon and her lover during happier times. Gyu-hee also gives us a smile intertwined with the scenes of the Byun Hyo-sung forlorn in the stairwell. To break up the video and give the other members a chance to shine, we are treated to cuts of the girls dancing in about three different rooms with different outfits for each. Nothing about the outfits is really that eye-catching or particularly revealing, but the girls look nice nonetheless. I was, however, not a big fan of Sun-kyung’s multi-colored hair, as is looks sloppy from time to time when the (what I assume to be) blond wig is placed over it in different scenes. It does look a bit cluttered at times if you’re used to seeing the girls as a five member group, but they fit together nicely as it’s still an uneven number which allows for symmetrical formations while allowing one girl to take center stage. The dancing is not the most dazzling or complex, but Sunny Days has been known for their vocals from the get-go and are often stationary during their live performances.They make it through the dance without any hiccups as it is kept simple, probably to allow stable vocals during live performances. Along with the dance segments, there are also stable shots of each member, each looking sad and wistful for better days, or singing passionately into the camera. The music video is a bit boring, but fits in with Sunny Day’s usual video repertoire. Perhaps when the girls gain more popularity, their MVs will have a richer, more creative story line and better camera work. The one change seen to the group itself is the addition of rapping to their songs. While this did start with their previous single, “Must Be Crazy,” it can’t be said that it adds or takes away from the performance. It’s delivered with the same vigor of the actual singing, so, at the very least, it’s not jarring. Sunny Days’ “Meet a Girl Like You” is a song that out-performs the music video. There’s nothing especially eye-catching with the choreography, costumes, or the plot. It’s a solid video as it follows the basic K-Pop formula and gets the story across, but you could listen to it and enjoy it just as well – if not more—sans the MV, only looking back to see who gets the guy, and if Seo-yeon really takes the jump. While the music video may be another dime-a-dozen love story, I would highly recommend taking a look at Sunny Days’ work. They’re a group where every girl carries their weight vocally and are a true joy to watch perform live. For this MV that neither dazzled or fizzled, I give them 3/5.